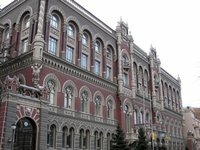 The National Bank of Ukraine (NBU) has pointed out a risk of increasing the target set by the International Monetary Fund (IMF) of 2.5% of GDP for the deficit of the national budget at the end of 2018, according to an inflation report for January 2018 posted on the website of the central bank. "Taking into account the methodological disagreements regarding how to keep the funds from special confiscation in the national budget revenues, the deficit may exceed the IMF target," the NBU said. In addition, according to the estimates of the National Bank of Ukraine, there are risks of incomplete implementation of budget revenues, viewing expenditures in the direction of increasing and short-falling of funds from non-debt sources of financing. "In general, the fiscal policy in 2018 will be pro-inflationary, although it will give a certain fiscal stimulus to economic growth through activation of consumer demand and continued financing of development costs," the NBU said. As reported, in November 2017, an IMF group of experts who came to study then the bill on the national budget of Ukraine for 2018 was on an official visit in Kyiv. Following the visit, the IMF made a statement on continuing negotiations with the Ukrainian authorities around the bill in order to ensure that the national budget deficit meets the target of 2.5% of GDP, which was approved within the IMF-supported economic reform program for Ukraine.